Can Jerry Brown Make One More Comeback? How do you want us to tell the Jerry Brown story? As a comeback tale? A mystery? A quest? A love story? A little-guy-makes-good story? 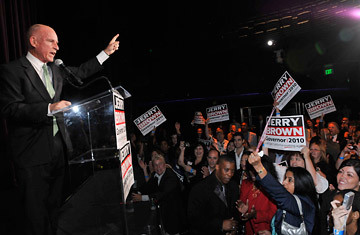 Jerry Brown, speaks to a small crowd at the Nokia Theater in June. How do you want us to tell the Jerry Brown story? As a comeback tale? A mystery? A quest? A love story? A little-guy-makes-good story? He is all of them, the comeback kid at 72, the former two-term Democratic governor and three-time presidential candidate who fell from grace, searched for spirituality, found love and worked his way up from two-term mayor of Oakland (1998 to 2006) to current state attorney general to, possibly, if he can get those phones hooked up and empty desks staffed, governor again. He is a one-man political dynasty (scion of an actual dynasty, since his father Edmund "Pat" Brown was also governor), begetting yet another reborn version of himself, wiser, more empathetic, more effective, though he will argue that is a conundrum. "If I say I've learned anything, then it means I didn't know anything before. If I say I didn't learn anything, then I'm not learning anything." In this dark season of deficits and crises and panic and electorate revulsion at Sacramento gridlocka version that makes Washington look positively efficienthe claims to be, all conundrums aside, exactly who California needs. Much has been made of California's crisis, of schools underfunded (some schools ended classes a week earlier than scheduled because of the budget shortfall), prisons overcrowded, highways rutted, water polluted, businesses fleeing, house prices still collapsing, and the sense of crisis is omnipresent, from the potholes that jar you as you drive down I-880 to get to Brown's garage to the foreclosed properties that surround the charter schools he founded. Yet the ideas floated to fix the state by Republican candidate Meg Whitman are blandishments that sound goodyes, we should focus on jobs, schools and making government more efficientbut that Brown will tell you are consultant-conceived generalities. He is quick to contrast himself with Whitman, pointing out every instance where her theories crumble against the realities of actually governing. "I've done this," he explains. "I've been in government and overseen thousands of businesses. I've run charter schools. Those are businesses. She ran her ... her website. [Whitman was the first CEO of eBay, one of the most successful Internet companies in history.] That's one business. She can say whatever she wants. But if you have never worked in government, with civil service, collective bargaining, local activists, public records, public exposure, the meetings, you don't know. It's a different world. That's like someone who's never dove in a river and says, I know what swimming in a river is like." Brown is reacting to the Whitman campaign's hard sellher TV ads are inescapable in Californiathat business-savvy Whitman is a red-tape-cutting pragmatist who knows "how to balance a budget." In conversations, she casts Brown as the ultimate apparatchik, "100% beholden to the special interests," she told me a few weeks before winning the Republican primary. Yet Californians have heard this pitch from a supposed outsider before, and now Governor Arnold Schwarzenegger enjoys approval ratings as low as Gray Davis' when he was recalled. The contrast in styles between the two campaigns is striking. Whitman has employed, at a cost of a few hundred thousand dollars a week, dozens of the top political consultants in California and has already gone through an estimated $91 million of her billion-dollar fortune. Brown had spent approximately $400,000 by the time he won his largely uncontested June 8 Democratic primary. Whitman is rarely unaccompanied by one of her consultants, who also sit in on interviews. She is relentlessly on message (she seldom strays far from these three points: schools, jobs, budget), yet the conversation is muted, and even after meeting her, one leaves with little sense of who she is. The latest Rasmussen poll has Whitman leading among likely voters, 47% to 46%.